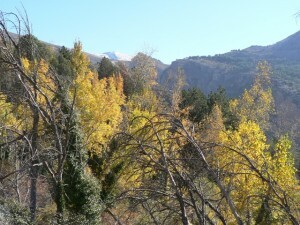 Autumn is a great time for hiking in the Sierra Nevada. Leaves turn gold, the trees are laden with fruit and the high mountains are dusted with the first snowfalls. Daytime temperatures are ideal for walking at intermediate altitudes. Come prepared for rain, although with any luck you will enjoy pleasantly warm, sunny days. We have picked out a few of the best walks to do in autumn. This is only a small selection of our hikes – for a full list of walks that you can do in autumn, click here.